Teeth need to be removed for a variety of different reasons. Whereas some succumb to long-term tooth decay, others are jostled loose or knocked out due to severe physical trauma. In any case, if you have missing teeth, you should consider utilizing dental implants or dentures. Dental implants and dentures can be hugely beneficial, improving not only your appearance, but the overall functionality of your teeth as well. Interested in making use of high-quality dental implants or dentures in the Chicago area? Dental Innovations has you covered. Why Should You Get Dental Implants or Dentures? Though aesthetics are subjective, most people would agree that the toothless look is not ideal. By replacing lost teeth with dental implants or dentures, you would be substantially improving your overall appearance. The fact of the matter is that human beings need teeth in order to chew and eat food. Losing a tooth or more can be a serious detriment to your ability to eat. This is one of the many reasons why dentures and dental implants are so important. They make up for lost teeth, allowing you to chew and digest food at a normal level. Did you know that your teeth are vital in helping you pronounce words? If you lose your teeth, your ability to properly speak can become seriously compromised. Fortunately, dentures or dental implants can be used to replace lost teeth, ensuring that you always speak to the best of your abilities. Dental implants are quite different from dentures. Whereas dental implants are the better option in some situations, dentures are the better option in other situations. Dentures are, in simple terms, false teeth. They comprise an entire set of teeth and gums, mimicking the appearance of authentic teeth and gums. Capable of being taken out on command, they act more as an accessory than do dental implants. Dental implants are, for the most part, permanent. Once they have been inserted, they generally stay in place for 15 to 20 years. The only exception to this would be if they were to suffer severe physical trauma. 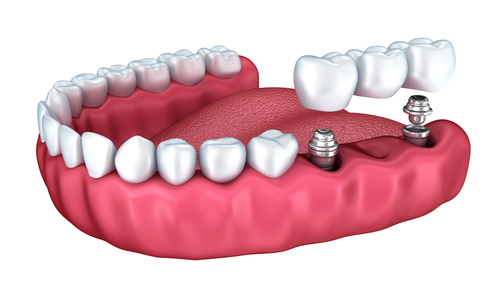 Generally, dental implants are used for those who are only missing a few teeth, not an entire set. While both dental implants and dentures will start to feel like a natural part of your body after prolonged use, dental implants are generally seen as the more natural entity. This is because implants are connected to your gums in the same way that authentic teeth are connected to your gums. By contrast, dentures aren’t connected to your gums at all; they simply sit atop your gums. In fact, on some occasions, they might even fall out of your mouth while you’re speaking. In any case, the option you choose will be based largely on your current tooth, gum, and jaw health. In order to get dental implants, you need to have a strong and healthy jaw and gums. If you don’t, dentures are probably a better option. In Need of Dental Implants or Dentures? Do you have missing teeth? Are you in need of dental implants or dentures in Chicago? If so, Dental Innovations can help. Our team of dental professionals is well-versed in all things dentures and dental implants. We’ll do everything in our power to make your experience a pleasant one.